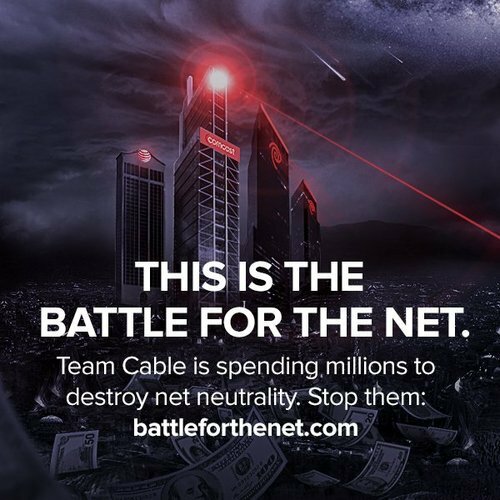 Net Neutrality is a popular buzz-word right now, but its political and tangible effects are harder to fathom. The most recent effect is that Netflix slowed down on the servers of Time Warner, Comcast, AT&T and Verizon. To resolve the issue, they agreed to pay a fee for faster internet access. If the providers are allowed to charge fees for access to faster speeds on the internet, we could soon face a corporately run system where the biggest companies have the loudest voice. This is already true in our political system and our traditional media. If it becomes true of the internet too then the promised democratization effects of online communication will fail. Let's put that another way. If companies can pay for fast lanes, they can also outbid everyone else to create slow lanes. This is a step away from full-on censorship. Right now your voice doesn't matter much in the world. Your elected officials don't really care what you think on an issue. The companies that provide you with everything you need to live don't care if they hurt or abuse you. What they all care about is the flow of money. Politicians overwhelmingly follow the money that comes from lobbyist and SuperPACs -- funded by businesses. Businesses overwhelmingly follow the dictates of their shareholders in making decisions -- intended to maximize profit, not benefit the consumers. You have one place now where your tiny voice can be magnified to the point where politicians and companies will listen -- at least some of the time. You have one outlet for changing minds. One location where a true democracy lives and thrives. If we lose Net Neutrality, we lose the last remaining bastion of individual power. There are a few, simple things you can do, right now. Use the power of the internet to save the power of the internet. Save not only your voice, but the voices of the oppressed around the world. Click here and learn more. Sign the letter (I did). Write your own letter (I did). Tell your friends. Demand an open internet. Demand your voice be heard.